I don't usually do much research prior to going on a trip. Never been a fan of guidebooks, TripAdvisor or even travel TV shows. 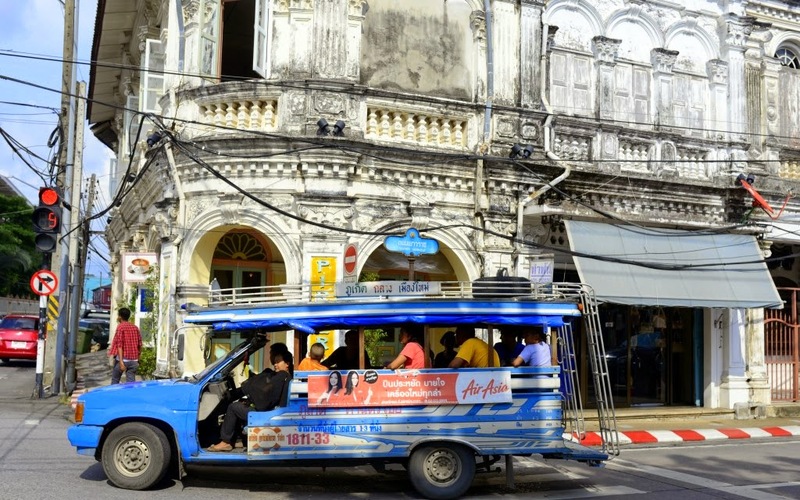 I know there are pros and cons to this type of vacay non-planning, and whilst I generally still like to leave the sightseeing aspect of my trips to the fates and furies, I recently decided to veer off my own beaten path to take a more academic approach to the feasting part of my weekend jaunt to Phuket. Hence, my new-found discoveries: Bang Pae Seafood Restaurant (that gorgeous bowl of clear tom yum goong above is divine proof of how good it is) and Raya, renowned for its authentic Thai cuisine that counts locals, celebrities and even members of the royal Thai family as fans. 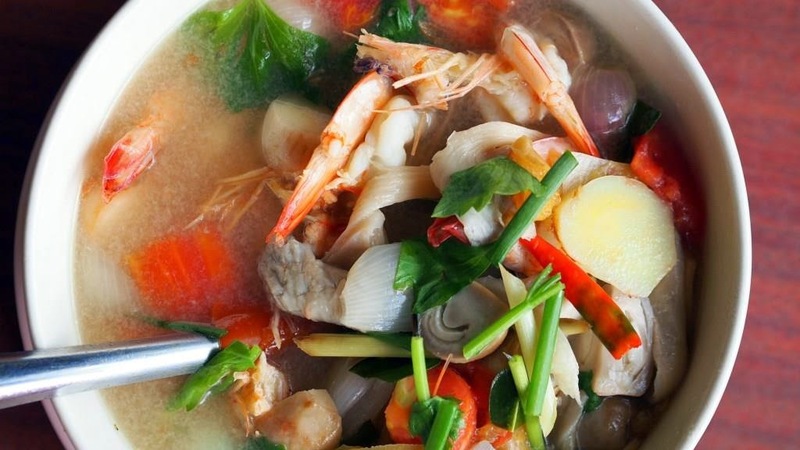 But first, Bang Pae Seafood Restaurant. 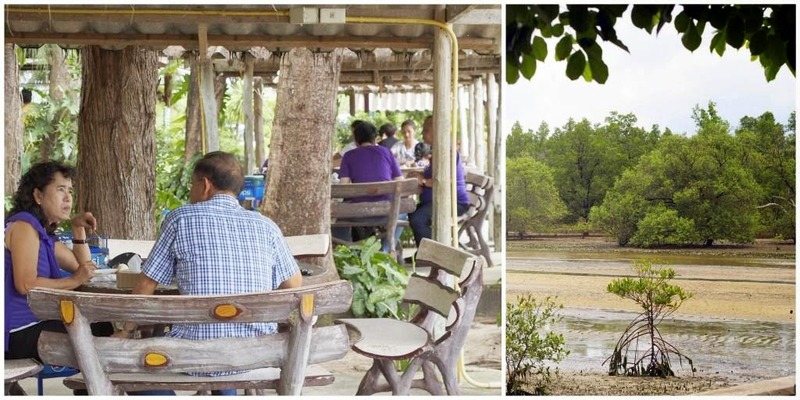 This little alfresco wonder situated next to a mangrove swamp (picture, above) is not exactly easy to find. Even with the helpful services of Google Map and GPS, pinpointing the right turns when I was driving up and down the eastern part of the island was a little challenging. 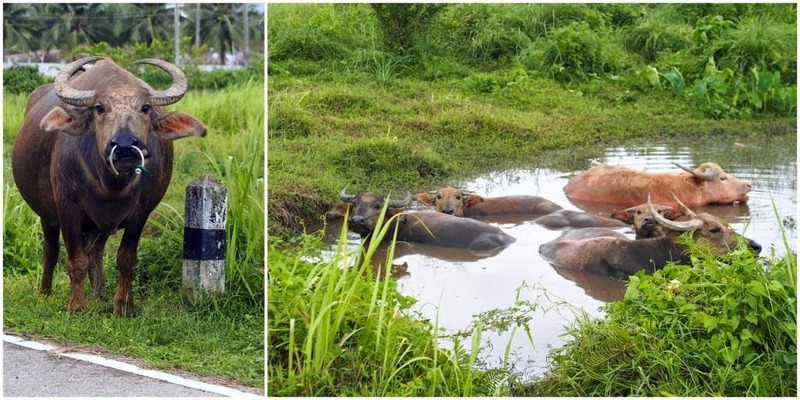 But it was there at the end of a little road that was populated by shrimp farms and six laid back water buffaloes, one of which was munching away on road side grass with the other five having an early afternoon group bath in the nearby pond. Papaya salad with the most (and largest) fried dried shrimp - still in their shells - I've ever seen. 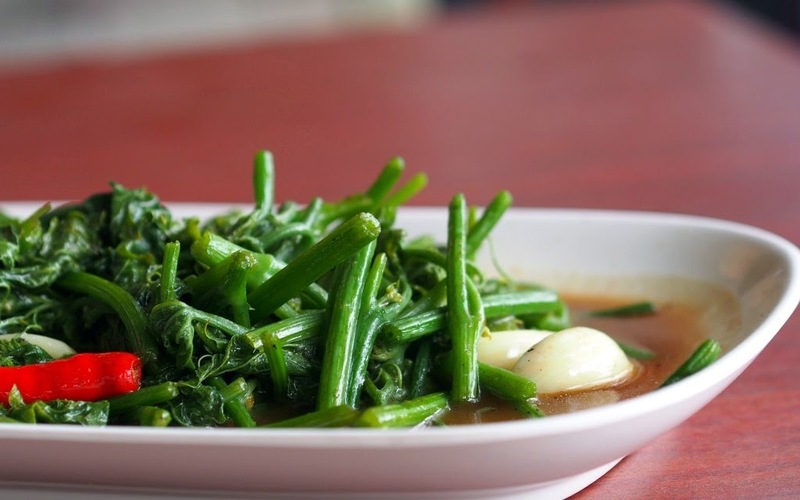 Stir fried fern with garlic and oyster sauce. I've never had this vegetable before - which is ubiquitous in Phuket - and I really like it. 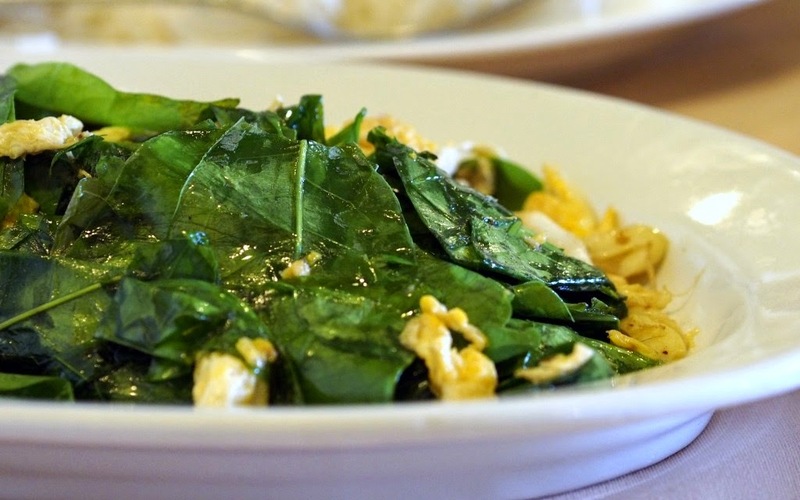 It tastes and looks like the love child of choy sum and kale with curly tendrils in the mix. Steamed whole fish with tamarind, chili and lime. Ahh..my perennial go-to comfortfood. 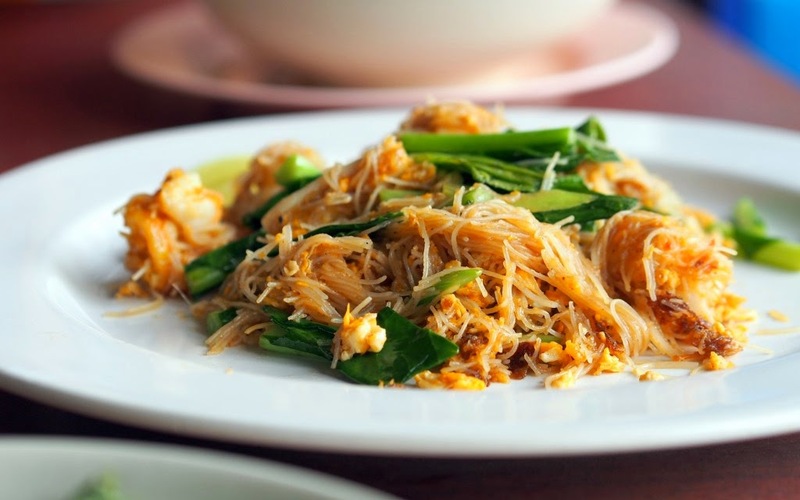 Fried vermicelli with fresh shrimp, egg and choy sum. Fantastic place for a leisurely lunch or dinner - for humans and mosquitoes alike. 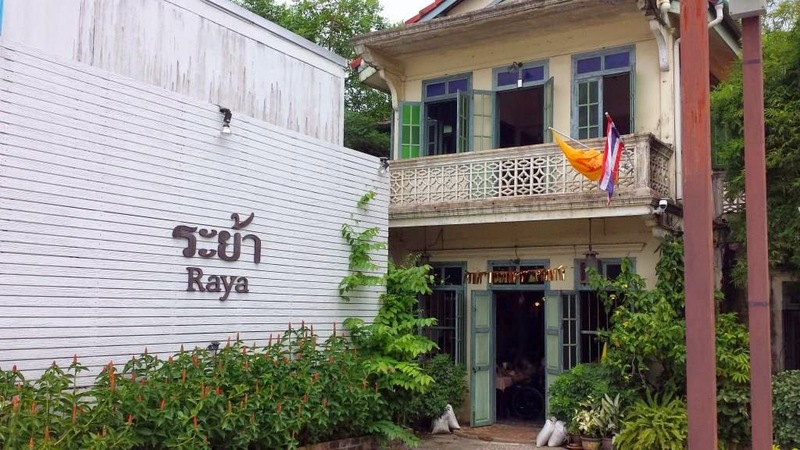 Next on the must-try makan trail is Raya, located in the heart of Phuket town - a hodgepodge of scruffy streets populated by primarily Thai-Chinese residents on a small grid. 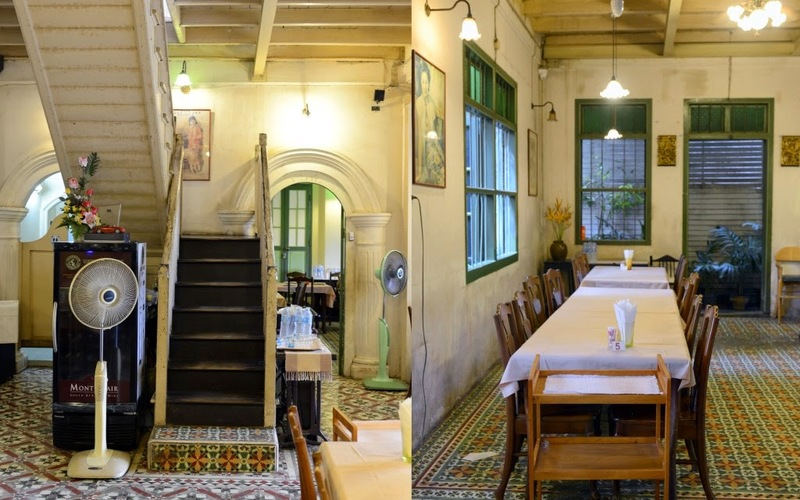 Singaporeans and Malaysians will find the town's colonial Sino-Portuguese architecture familiar, especially the narrow double-storey shophouses with the five-foot walkways in the front. Some have been gentrified and re-gutted to become boutique hotels, hipster coffee outlets and art galleries, but most still stick to selling hardware tools, household cleaning items, and school uniforms as they have done for decades. 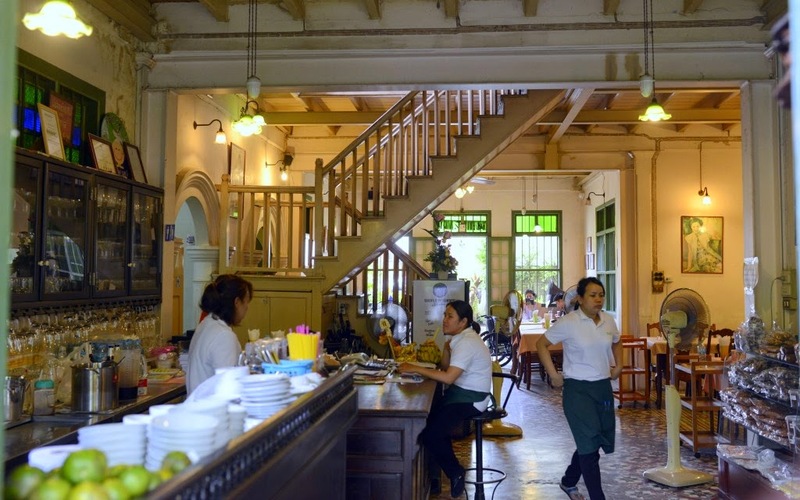 And it is just off the main town's thoroughfare - Soi Thepkasattri - on New Debuk Road that we found Raya in a charming two-story shophouse that belies its substantial size and depth within. The first thing I noticed upon entering Raya were the striking mosaic floor tiles which reminded me of the many shophouses of my childhood days. My second impression was how comfortably homey the restaurant felt, with its mismatched floor fans, long wooden tables, antique stained glass, exposed electrical wiring, faded 1930's Shanghai posters and scuffed walls. 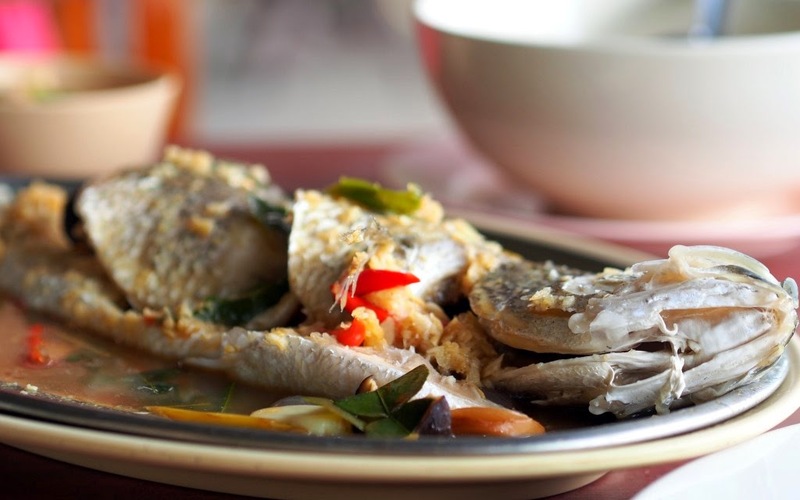 Arguably the best restaurant in Phuket, Raya's virtues have long been extolled by locals and international media titles such as Gourmet Traveller, CNN and Travel+Leisure. After marveling at the interiors (and what other diners had ordered,) we finally settled at our table in the blessed air-conditioned section of the house. 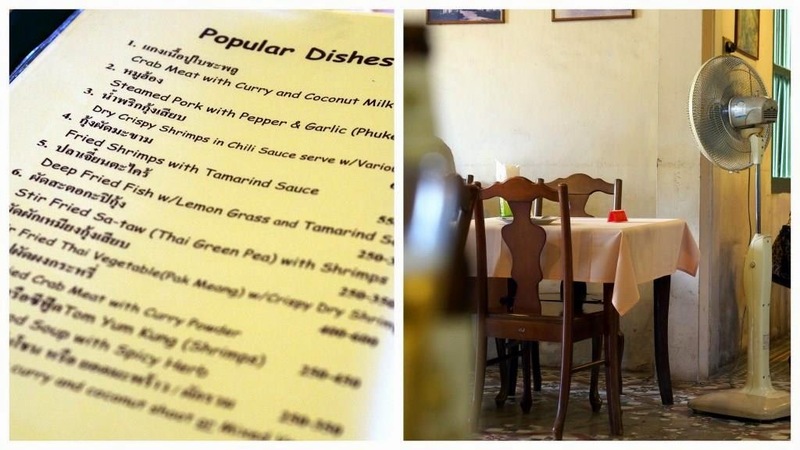 The menu is quite extensive, but luckily, it is helpfully sectioned into categories such as "Popular Dishes," "Phuket Specials" and by main ingredients such as Curries, Seafood, Noodles and so on. There are generally two sized portions for each dish so I would recommend the smaller ones for those who'd like to try as many Raya specialties that can be humanly sampled in one sitting. 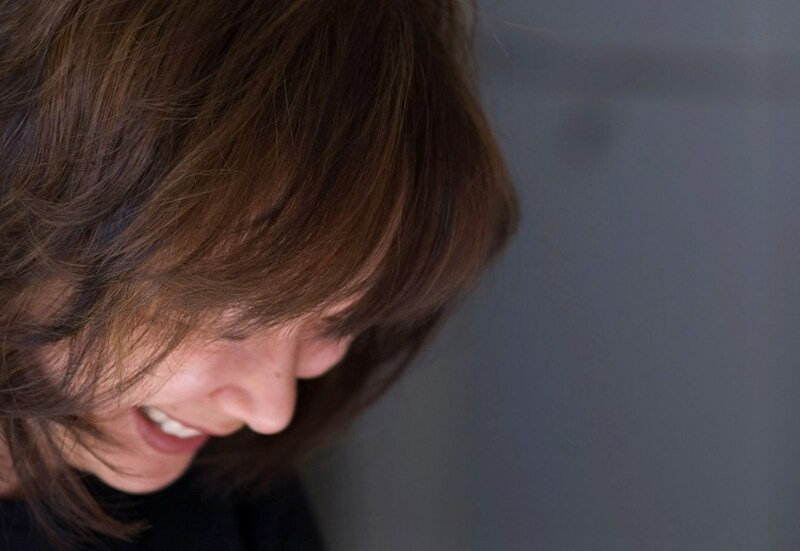 But for those who truly can't get enough, Raya's chef and owner Khun Kulab, like the efficient team at Yung Kee Restaurant in Hong Kong, is super equipped to pack any of her dishes for out-of-town diners to bring onboard the plane ride home. 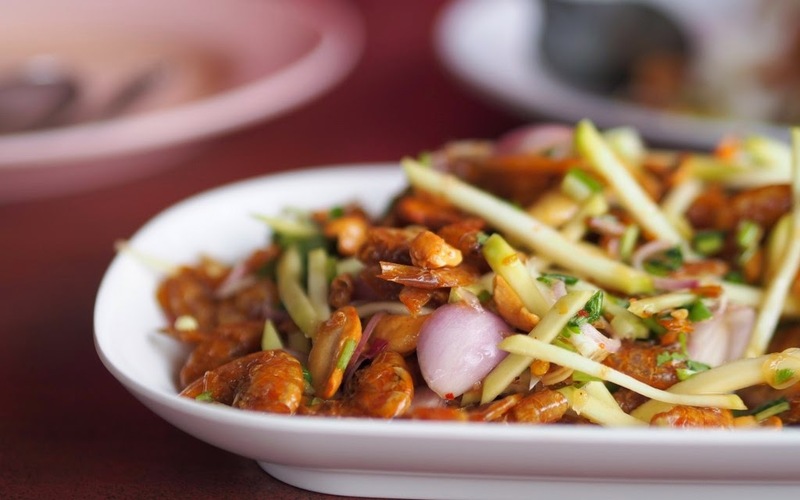 Crab meat with curry and coconut milk - this is the must-order signature dish of Raya. 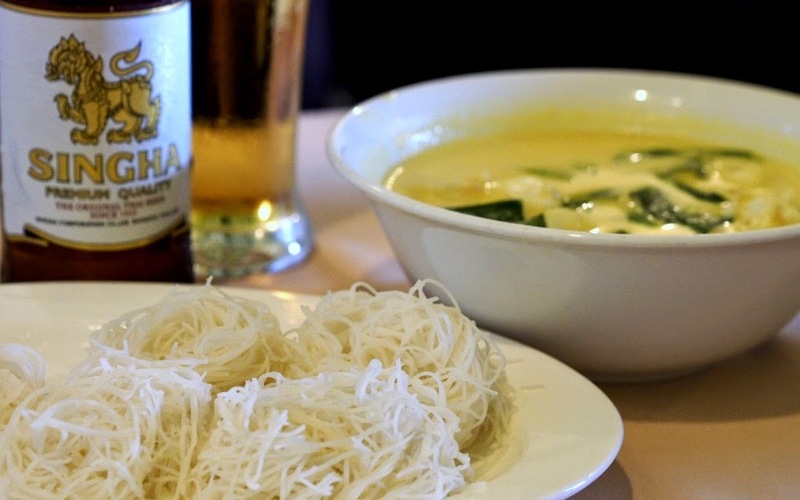 Serving it with rice vermicelli makes for a nice springy contrast to the curry. 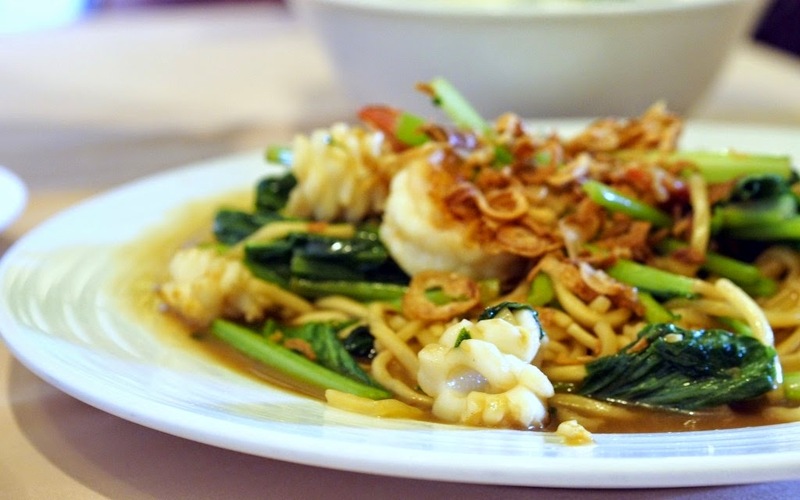 Every Malaysian will find this noodle dish very familiar. I love the fresh squid (I'm a total calamari fan) and the golden shallots add a crispy fragrant kick to the "wet" noodles. Stir fried Pak Meang - they don't normally serve it with egg but I'd asked for the substitution as I wasn't too keen on the dried shrimps. 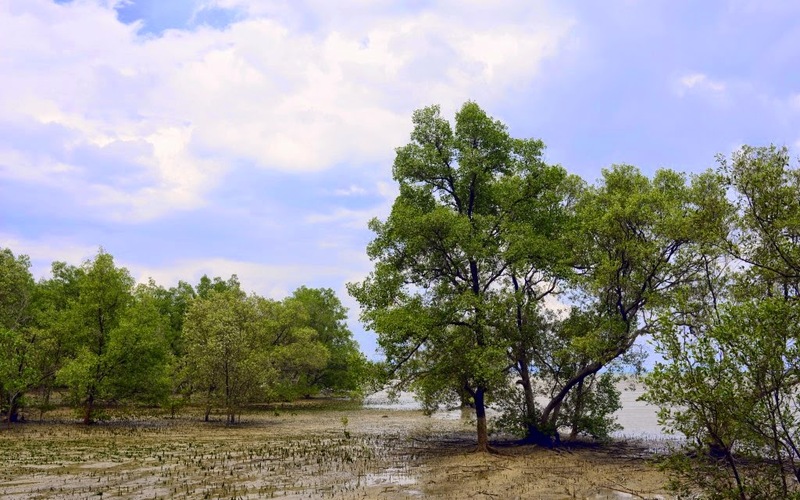 About nine kilometers from the Heroines’ Monument towards Ao Por Pier and only a few hundred metres further down the road from Bangpae Waterfall and the Gibbon Rehabilitation Project. The restaurant is on the right-hand side of the road. Look for the big red sign.